Some people consider that the physical appearance itself is one’s personality. However, this is far from being true. Personality in practical sense is a combination of your behavior, attitude and communication skills. Professionally, one’s personality could be judged on several aspects like interpersonal skills; how one understands and relates to others; corporate etiquettes; how far one applies best practices to deliver positive results; communication skills and much more. The influence of human personality upon the functional efficiency of an organization and its personnel has been widely recognized. The personality can also be modified to a certain extent. Thus, there might be a need for an effective personality development course for enhancing one’s personality, as such courses help enhance confidence level and develop positive thinking as well as right attitude. In recent times there have been a variety of efforts by professionals in various fields to design courses that will help develop certain positive trends in personality. The objective of such courses is to remove the barriers or obstructions that stand in the way of the expression of an individual through a process of training. An effective program on personality development helps one focus on one’s self-leadership skills. The range of topics covered in these training workshops includes interpersonal skills that guide you on how to carry a positive attitude and behave professionally. There are sessions on improving spoken English, as fluency in English is today a critical factor to communicate effectively in business. Personality courses also help enhancing your writing skills that guide you on how to write effective emails & business letters, as effective communication is the core of one’s personality. It is the way you portray yourself in front of the world. Training also incorporates public speaking sessions to help one speak correctly and confidently in public. Why attend Dr Prem’s personality development programs? Dr Prem has proven track record of successfully conducting best personality development courses across the world. Dr Prem and his team of experienced trainers have designed focused personality development programs that cater to varied needs of the candidates. Useful personality development tips are provided at the end of each session for an easy understanding. 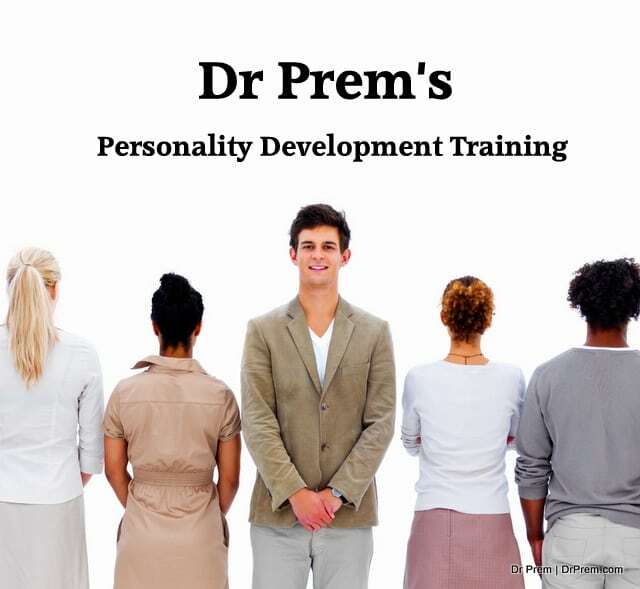 Dr Prem’s personality development workshops help participants gain insights on positive leadership, principles of success, foundation for success, positive attitude, positive self-esteem, self belief, importance of innovations & ideas, forming good habits, self confidence, leading the world in positive way etc.